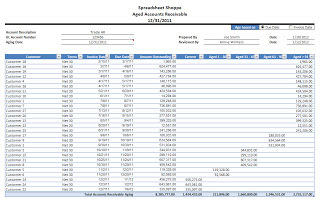 Why use an Excel Receivables Aging Report ? Unlike every other SAAS company out there trying to provide a dashboard with an Aging report , We believe that there are some benefits of providing aging reports in excel format.An excel report would allow you to run more analysis on the report which is specific to your company or industry.An excel report is also easily shareable and consumed by your colleagues or bosses.Who would want to go to an online portal and see the report right? Everytime you/your boss needs a receivables aging report you can head to this page and click on the link to obtain the latest aging report. Note : The data may not appear right away at times once the excel file is downloaded.